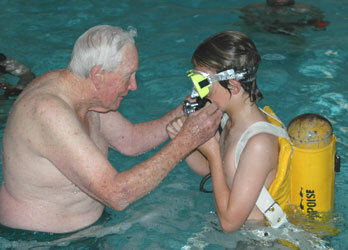 Australian inventor Ted Eldred is shown here with his grandson at the City Baths (the site of the first diving school in Australia) in April of 2005. Ted is recognized as the inventor of the single hose regulator. He introduced his Porpoise regulators many years before Rose Pro, U.S. Divers, or Sportsways sold their first models in 1956-57. 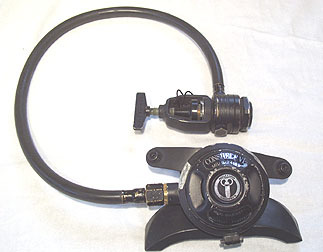 Ted invented the Porpoise single hose regulator in 1949 and sold his first one in 1952. Air Liquide bought him out in the 1960's and supressed his regulator, but some were made to fullfill the existing Royal Australian Navy contract. The Porpoise regulator shown on the right is a Royal Australian Navy model, owned by Stephen Taylor of Australia. Ted confirmed it to be the last ever sold to an individual. Unfortunately, Ted passed away on August 27, 2005. --Photos courtesy of Stephen Taylor. This is a very hard to find non-magnetic U.S. 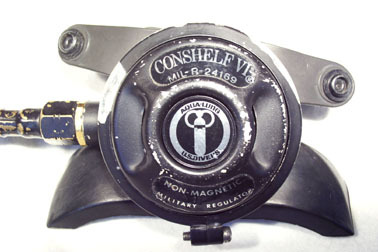 Divers Conshelf VI military regulator. 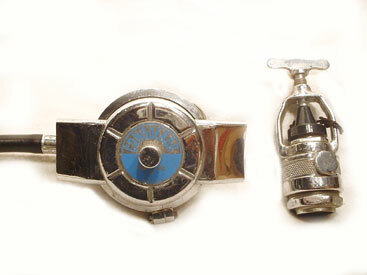 These were introduced in the mid-1960's, replacing the non-magnetic DA Aquamaster. They were used by Explosive Ordinance Disposal (EOD) teams when working around magnetic mines. The U.S. 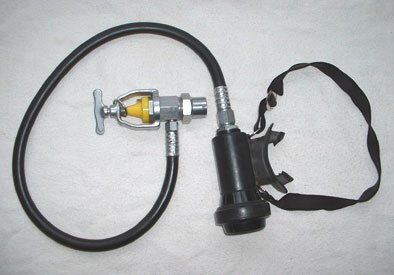 Divers Aquamatic came out in 1957 and was their first single hose regulator. 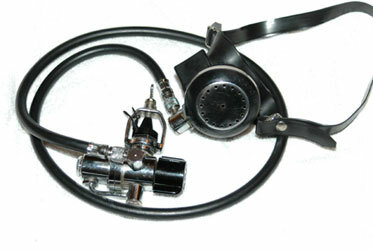 This was the only regulator at that time with the side exhaust, and both the side exhaust and the Aquamatic itself were short-lived. The diaphragm had a built-in mushroom valve that allowed the exhaust air to escape. This complicated diaphragm tended to perish very quickly, and they are almost impossible to find in good shape today. Healthways Scubair Sonic, from around 1971. Sold for approximately $110.00. The first stage produced an audible warning when the tank was on reserve. This was the last model of the series that started in the mid-1960's. Many diving companies had audible reserves; Scubapro made the Mark VII first stage, and U.S. Divers had an actual tank valve with a rod extending into the tank. It hammered on the side when the tank was low. 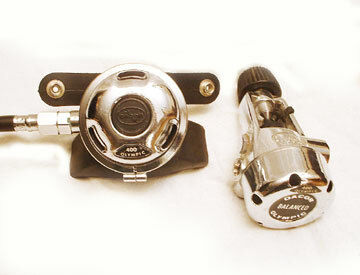 GSD Spinnaker regulator, circa 1978, made in Italy. Very scarce in the USA, but made known from the movie "The Deep", starring Jaqueline Bisset. Very small and lightweight second stage, but poor quality and prone to free-flowing. The Dacor Olympic 400 was a top of the line regulator in the early 1970's. The Olympic 800 was the same as the 400, only with a built-in reserve. Both had balanced first stages. The Olympic second stage regulators had a dual exhaust system for minimum exhalation resistance. The Olympic 400 sold for $95 in 1973 and the 800 sold for $115. Voit Avalon, circa 1965. 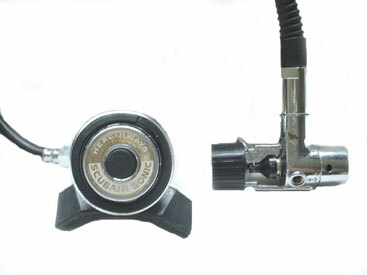 This was Voit's most inexpensive regulator at that time, and sold for $37.50. It had a piston first-stage with only one moving part. The second stage had a tilt valve. The Voit Conqueror was manufactured beginning in 1962. 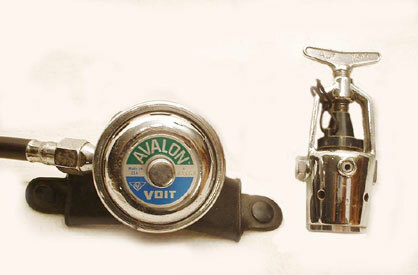 It sold for $60 in 1963 - the same price as the Voit 50 Fathom two hose regulator. This design had an exhaust valve built right into the second stage diaphragm. Voit Dolphin II, circa 1970. 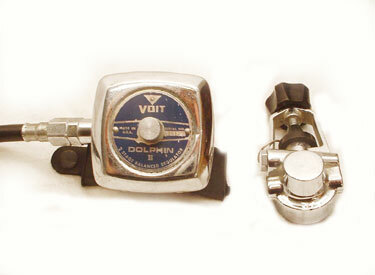 The unique square-shaped second stage makes the Voit Dolphin II easily recognizable. The second stage had a lever action downstream type valve, and the first stage was fully balanced. The first generation of Voit Dolphin was used in the James Bond film Thunderball. 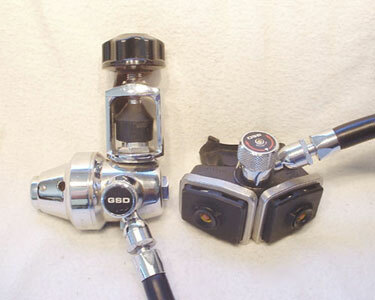 The price in 1970 was $85, and it was one of Voit's top of the line single hose regulators.